I was a vegetarian for 4 years of my life in college and after. When I got pregnant with my son, I decided I would eat white meat because I wanted to give him all the nutrition he needed to be healthy and grow. After that I continued to eat some meat here and there but recently I've started cutting it out again and I want to eventually go full on vegan. It's going to be hard but I think I can do it because I have never really enjoyed animal products. I just have to make myself eat more fruits and veggies. My first step in this journey is breakfast. I've started going completely vegan for breakfast, making shakes every morning. Before I started this I never ate breakfast because I never gave myself the time to. I would always skip breakfast, get so busy at work and not eat lunch, then make myself some kind of carb-a-licious meal when I got home. NOT GOOD! I don't want to lose weight (although that would be a plus) I just want to feel better, have more energy and be all around healthier. SO with all of that being said, lets get into the recipe. I have all of this sitting out on my counter (except the bananas and milk) in pretty containers so I can easily access them in the mornings. I can quickly make these shakes before work and take it with me if I need to. I feel so much better throughout the day and feel full until lunch time, WIN!! I hope you enjoyed this first recipe of mine! I won't be posting many more because like I said, I'm the worst cook... 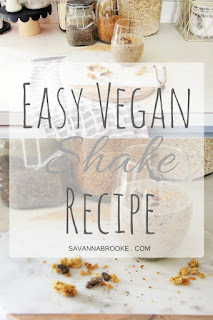 But I am loving this shake recipe lately. Let me know if you try it and what you think! I'd love to hear from you!